UI Object that displays an image elements based on the output from a module. The object can display either a color image by specifying the type "rgb" or a gray scale image by specifying the type "gray". 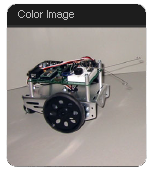 Gray scale images can also be rendered in pseudocolor using the type "fire" or "spectrum" depending on the desired color table. type gray, rgb, fire or spectrum "gray"
source name of the output to be visualized; for color images use the form "source1+source2+source3" for the three RGB channels. Starting with version 1.4, all sources must come from the same module. file file name of image to show. If set this parameter will override the module and source parameters.